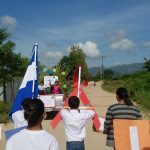 The Montana de Luz students have always attended the public schools in Nuevo Paraiso and Nueva Esperanza, but as with children everywhere, some have an easier time learning than others. Four years ago, the Escuelita, or “small classroom,” was created at MdL, under the leadership of Profe Fany, teacher, and Jacqui Campbell, long-term volunteer. The classroom today has eight special students with a variety of skills and learning difficulties who attend school there each day. Each student is assessed to determine their strengths and needs, and each one has an Individual Learning Plan (similar to an American Individualized Education Plan, or IEP) which is evaluated and updated year. Reading, math, and science are usual classes, but there is more … In our quest to raise capable individuals, these MdL students also learn basic living skills and social interactions they will need to be independent adults. 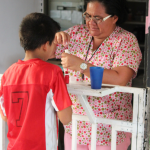 Two of our students have progressed in the Escuelita to the point where they can return to the public schools. Samuel is currently studying at the High School, and Tato will return there in February. Congratulations to them for their hard work and tremendous achievement! I truly believe that a good education is the key to a successful life and a way out of poverty. I salute Profe Fany and her assistants who make all of this possible. This is why I will Walk 4 Education this Saturday! Will you join me?